Family reunions and neighborhood celebrations have been a long tradition at Hinkletown and Greene Valley. Alumni and a teacher from Hickory Ridge School. Attendees took golf cart tours of the old town, the three long-gone general stores, sawmill, blacksmith shop, brick factories and the site of the school. Descendants of Hudson, Grey, Corridan, Florang, Darling, Weimer and McCune families of Hinkletown. The above photograph is one of several brought and shared at the reunion. 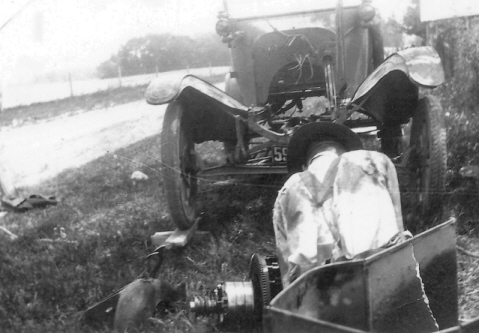 The image is of Charley Weimer rebuilding a car engine in front of the Harrison Wade home in the 1930s. Descendants of the Corridan, Grey, Hudson, O'Rourke, Starkweather and Wiseman families of Hinkletown visit the Iowa County Genealogy Society in North English during the reunion on Saturday, October 11, 2008. Kristi Black of Banjoy entertains the crowd with an old time favorite game while the band plays in backbground. 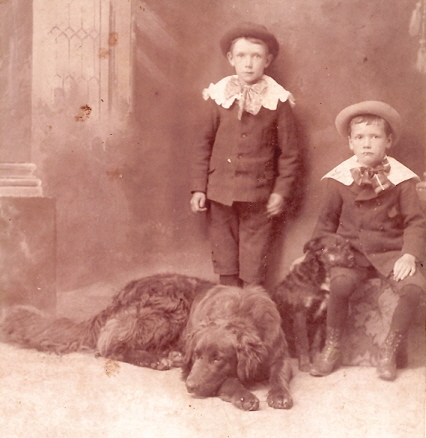 Another photograph shared at the reunion: Sons of Margaret and Edward Florang, taken about 1899. Many of the businessmen of Hinkletown were Civil War veterans and Masonic Lodge members. 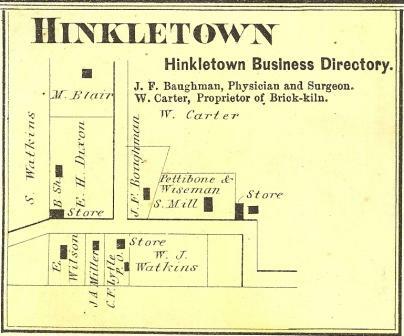 The businesses of Hinkletown (above) from 1875. Buinessmen included Edwin H. Dixon - storekeeper, James A. Miller - storekeeper, John F. Baughman - physician and surgeon, William Watkins - brickmaker, William Carter - brickmaker, C.F. Lytle - storekeeper, B. F. Pettibone - sawmill owner, Adam Wiseman - sawmill owner and Philetus Axtell - blacksmith. Another blacksmith, Jeremiah Suiter, is not shown. Harmon Henkle, the namesake of Hinkletown, had left to set up a new store in Keota in 1872. His general store is shown at the far right, north side of Main Street. Philetus Axtell's blacksmith shop is located on the left end, north side of Main Street (marked "B. Sh.") Jerome Palmer worked for Henkle and Pettibone. A dozen businessmen of Hinkletown were key leaders of Farmers Lodge # 168 during the peak of Hinkletown's existence in the 1860s and 70s. Edwin H. Dixon was a sergeant in Company D, 8th Iowa Infantry. When he returned from war, he engaged in the mercantile business at Hinkletown, Foote P.O. (at left), with business partner James A. Miller. Miller moved with his parents to Iowa in 1854 and entered land in Greene Township, near the site of the Greene Valley School, and what became the first location of Farmers Lodge # 168. After the breaking out of the Civil War, he journeyed over to Illinois and enlisted in 1864, Company B, 150th Illinois Infantry. His career as a soldier was cut short by the close of the war in 1865, when he was mustered out and came back to Foote. Dixon and Miller both joined the Farmers Lodge, each holding officer positions during the time they ran the general store on Hinkletown's Main Street. Philetus M. Axtell was a Corporal in Company H, 2nd Iowa Infantry, and when he returned became one of multiple blacksmiths at Hinkletown, and a lodge member and officer during the 1860s. Jerome Palmer, was a fife player for Company B, 28th Iowa Infantry, a lodge member and officer, and business associate of Harmon Henkle and B.F. Pettibone. John F. Baughman, Physician and Surgeon, was the town doctor for Hinkletown, also located on Main Street. 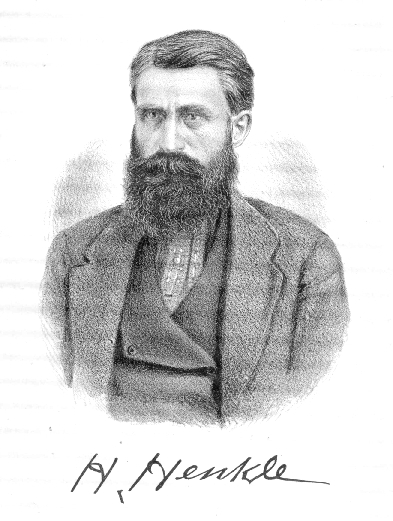 He was Secretary of the Farmers Lodge for several years during the 1870s. William Watkins, who settled at Foote in 1852, operated brick manufacturing for 14 years at the Hinkletown site, and was an officer in our lodge during the 1870s. William Carter also ran brick manufacturing at Hinkletown and was a lodge member during the 1870s. C.F. Lytle, also a member and officer of Farmers Lodge operated a general store and was post master of Foote Post Office on the south side of Hinkletown's Main Street. B. F. Pettibone and Adam Wiseman, both lodge members, operated the Henkle sawmill during the 1870s. Harmon Henkle, an early lodge member of 1863, ran several businesses in Hinkletown, including the Pioneer General Store of Henkle and Littler. Nathan Littler, Henkle's partner, was a State Representative and Maonic lodge member from Washington County, Iowa. General Store letterhead of Dixon and Miller, 1879, Foote (Hinkletown), Iowa County, Iowa. Both were Civil War veterans and Masonic Lodge Officers. 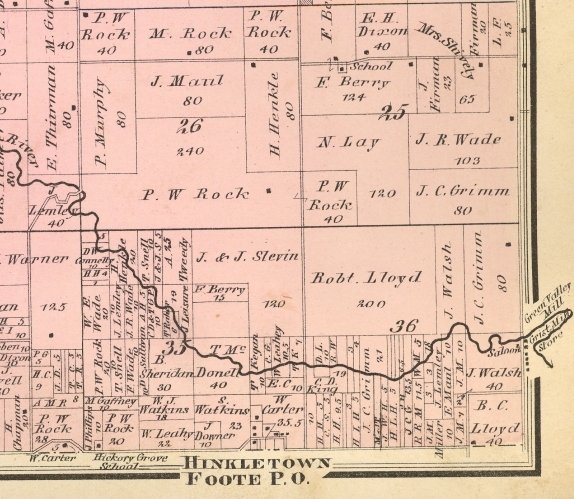 Map showing Hinkletown, Foote Post Office and proximity to the English River, and the village of Green Valley, 1874. Green Valley, a mile east of Hinkletown, had a general store, grist mill and saloon. Hinkletown, Foote P.O., 1874: (Left) From the Atlas of Iowa County, Iowa, Harrison and Warner, Clinton, Iowa, 1874. This is the earliest known published layout of Hinkletown. By this time the town had begun to experience a decrease in size and population, with the relocation of Harmon Henkle, his family and several business associates, to the new railroad town of Keota, Iowa, nine miles directly south, in January of 1872. Business associate Jerome Palmer built Henkle's new general store in Keota. Henkle, Palmer and several of their Hinkletown associates helped organize a new Masonic lodge in Keota, Adelphi Lodge # 353. Hinkletown rebounded for a short period, until another railroad town of Kinross, four miles south, was established in 1879. Many of the homes at Hinkletown were physically moved to Kinross during that time. Edwin H. Dixon and James A. Miller, both Civil War veterans, and lodge members opened a store on the north side of Hinkletown's Main street, and C.F. Lytle operated the store and Post Office on the south side of the street. In 1901, the Farmers Lodge #168 petitioned the Grand Lodge of Iowa to be able to move to Kinross, the new center of population, after several of the lodge members and businessmen of Hinkletown physically relocated their businesses and homes to Kinross. The second Hickory Ridge Schoolhouse at Hinkletown was built about 1874. This photo was taken approximately 1899 - 1901. The first school was a log cabin built by early settlers in the summer of 1849 and was documented by Jeremiah M. Suiter and brother Mordecai Suiter, settlers of 1846. 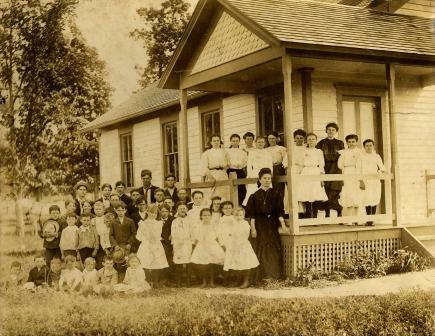 The first school was called Hickory Grove, and was built on a hill just west of Hinkletown. 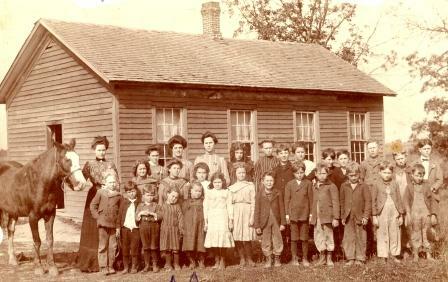 The third Hickory Ridge Schoolhouse at Hinkletown was built in 1906. This photo was taken on July 4, 1907. Teacher - Nellie Kernan, Photographer - V. L. Berryhill. Harmon Henkle of Hinkletown - storekeeper. Henkle ran the sawmill and lumberyard at Hinkletown. He also started the first general store and bank at Keota, Iowa, and later opened a lumberyard in Kinross, Iowa. Copyright 2008 - English Valleys History Center, North English, IA. Video Documentary "Rediscovering Hinkletown" Planned for Release 2009.